Functionality：Shoot at any angle, anywhere using the 3-way panhead with quick release plate. Smooth 360-degree panning is great for full panoramic shots. Flip lock legs and sturdy base give a steady shot on any terrain. Quality Materials： Tripod body is made of aluminum alloy and eco-friendly ABS plastic. Maximum diameter of 25mm. Tripod feet made of soft, non-slip rubber make it easy to shoot on uneven surfaces. Lightweight：Weighs only 1.18KG (2.6lb). Folding portable design makes it ideal for carrying and travel. Handy carrying bag included. Adjustable： From 18inch to maximum height of 55inch. Tripod body contains 4 section legs, 3 locks and center column for support. Add weight to the hook for extra stability. Ergonomic Design：Soft foam handles ensure a comfortable, firm grip. Center-column hook included. Attach additional weight to adjust the tripod’s stability. 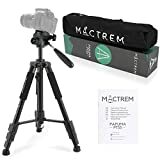 The Mactrem PT55 AKA the Papuma is the perfect entry level Tripod for new photographers. It is sturdy yet lightweight build makes it easy to carry, while its adjustable functions makes it easy for anyone to get the shot that they want. It is functionality is suited for a variety of equipment, camcorders, DSLR’s, mirrorless, you name it. Available in three colours – Black, Orange, and Yellow – express yourself and your photography with our beautiful Papuma Tripod. Easily adjustable 4-section, 3 lock column legs with quick release hooks. Lightweight, yet supports loads up to 5KG / 11lb. Ergonomic handle to lift shooting axis and take pan shots. Easy to fold up and carry. Great for traveling! This entry was posted in Discount Photography and tagged 55Inch, Aluminum, Black, Camcorder, Camera, Canon, DSLR, Fuji, Lightweight, Lumix, MACTREM, Nikon, Olympus, Pentax, Sony, Stand, Travel, Tripod, Video by Ball Photo. Bookmark the permalink.